Happy Friday! With summer drawing to an end, The Baron and I are spending time with close friends while our schedules still allow. Not everyone keeps childhood friends throughout the years due to a host of variables... but when folks are able to do so, it really is a special thing. I met The Baron's best friend, G, last year and I remember being so nervous to meet him. Thankfully, we soon became friends and had some time to get to know one another. Both of them grew up down the street from each other when they were kids and have since maintained a very strong and close bond. I like seeing The Baron light up when he talks about the crazy fun they've had together with the usual pranking, joking, and just silly antics they got into. When we found out G and his partner were moving out west earlier this year, we were sad to see them go. Helping them move and packing up their moving truck didn't help either. But at least we're getting the opportunity to spend time with them and check out their new surroundings! Friendships... they are something that should be treasured and I'm thankful to have my share. Even better is when someone you love invites you to share theirs too. With all the fuzzy feelings of friendship in the air, I've partnered up with Merci European Chocolate who's highlighting friendships of all kinds this month. To celebrate, we're giving away a Friendship Kit! 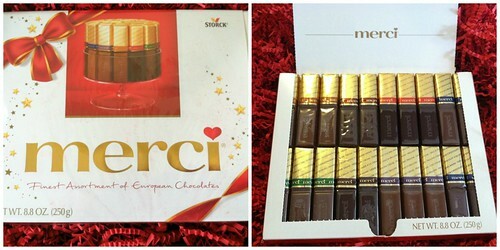 This Merci European Chocolate item features a fine assortment of European chocolates. The assorted chocolate box features seven varieties of rich European chocolates. This finest chocolate collection comes with 20 individually wrapped pieces. For this giveaway, we're sharing what makes our friends special and meaningful to us. A random winner will be chosen and receive the following in their friendship kit... because what's a better thank you [or 'Merci!'] than chocolate?! If you’re interested in participating, leave a comment describing your best friend and what makes them special or meaningful to you. A winner will be randomly chosen on Sunday, September 1st at midnight [CST] and announced on Monday, September 2nd to claim their prize via email. Good luck and I can't wait to hear all about your friendships! My best friend is a wonderful, loving person. She is compasisonate and kind, and has helped me though so many things in my life. I am so grateful for her! My best friend is so much fun. He is always encouraging and truly cares about me. My best friend and I have known each other since we were in first grade. Our moms have also been best friends since they were in junior high. It is amazing to have been friends with the same family for 40+ years. Although we never lived in the same town (or state), we have always been close and hopefully will always be best friends. I hope our kids will be too! I met my best friend twenty years ago this month! We became so close that my family became hers, and hers, mine. We even introduce each other as our sister, because we really are. We have such a special sistership that she moved in with my husband and I so that I would not be alone when he went out of town for work several times a week. God was gracious to give her to me, and I don't know what I would do without her friendship, her thoughtfulness, her selfless acts of constantly helping me, her constant companionship, and her unconditional love. I am a girl that have been blessed to call 2 of my closest friends my best friends. They are both have such kind hearts and were there for me when I was diagnosed with cancer last year. They are my sounding board and protectors. I am going to be so sad to see 1 of them move in the next month or so. She is a talented photographer and has brought me out of my shell when it comes to being photographed. My other best friend just embarked on a new journey into teaching. We have known each other for about 10 years now since our college days. At one point in time we had no contact for almost 4 years but as soon as we saw each other everything just fell into place as if we were never away from each other. I am truly blessed to have these 2 women in my life. I have known my best friend 6 years and she is the most loyal person I have met. She is always here for me no matter what. Through relationships, marriages, kids, court trials, etc. we have gone through everything together. She truly is the best friend a person could ask for!